It is possible to get to Gwangju Family Land using public transport, but doing so is far from straightforward for those who can’t read Korean. I’d planned to take the KTX to Gwangjusongjeong followed by a local train to Gwangju, from where the Internet said that I could catch bus #26 to the park. There were no bus stops at either exit of the station, however, and after twenty minutes of wandering about I gave up and got in a taxi. The fare was just 9000 won (~€7), a bargain for those used to European prices, and given that I decided to save a bunch of messing around on the return journey by traveling directly to Gwangjusongjeong. That trip cost 16000 won (~€12.50) and took less than twenty minutes, though that was mostly because my driver maintained an average speed well in excess of the posted limit. When I first visited the park back in 2013 it looked more than a little shabby, and though renovations have been made over the intervening years it remains obvious that the place is operating on a limited budget. 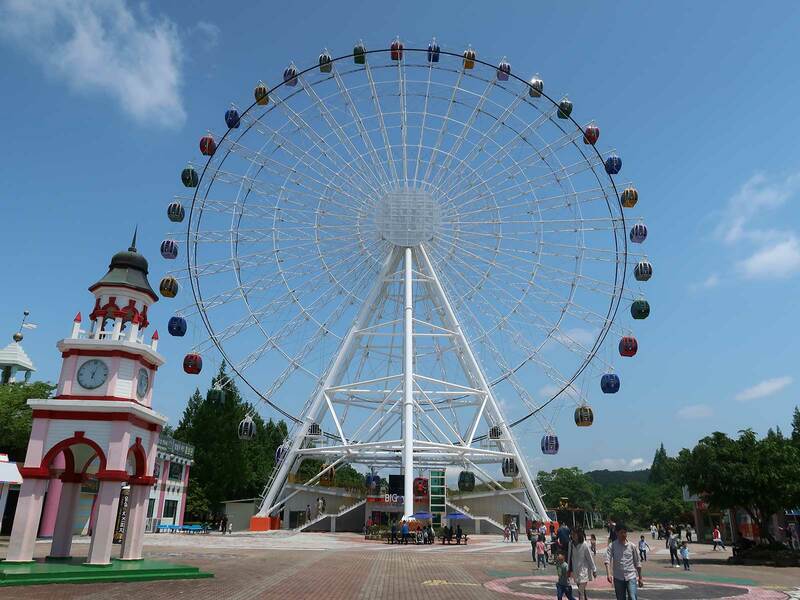 Much of the investment has gone into new family rides, though the entrance is now marked by a shiny modern Ferris Wheel with tinted windows and air conditioning. I headed there first, figuring that it would be a good way to ascertain the lay of the land. Unfortunately it wasn’t included within the “free pass” unlimited ride ticket, a rather blatant con that left me distinctly unimpressed; if I’d gone with the pay per ride option I’d have been able to do one lap of each coaster and the wheel while still coming out ahead. Dragon Chase (#2423) is now the oldest operational Meisho coaster with inversions, an accolade inherited late last year with the demise of Thunder Coaster at Nasu Highland. The layout features a drop, a loop, a double corkscrew, and not a lot else, presumably because the potential energy budget was fully spent — the train arrives at the brake run at no more than walking pace. The comfort level is better than average for the period, with the only significant bump coming at the entrance to the second inversion. That being said, the restraints are heavy and extremely unforgiving, meaning that defensive riding is still advisable. I decided against tempting fate with a back seat, selecting the front for both of my laps. My next stop was at Atomic Mouse. Three cars were in use today, with a fourth under a tarpaulin on the transfer track, though only one was being allowed on course at a time resulting in a slow moving queue. The operational vehicles were numbered three through five, suggesting that at least one of the original fleet has become a parts donor to keep the rest functional. The experience today was more lively than I remembered, aided considerably by the fact that the various block brakes were not in use. I’d have liked to have experienced the 3D Cinema that stood next to the coaster on my last visit, but all that was remained of it today was a concrete pedestal protected by a makeshift barrier. The Police School funhouse was closed, and I wasn’t about to risk the Flume Ride with a two hour train journey ahead of me. I did a quick walkabout to make sure I hadn’t missed anything, and with that complete I headed out to the taxi stand.